Having a good relationship with money is tough—whether you have millions in the bank or just a few bucks to your name. Why? Because just like any other relationship, your life with money has its ups and downs, its twists and turns, its breakups and makeups. 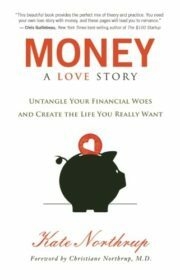 And just like other relationships, living happily with money really comes down to love—which is why love is the basis of money maven Kate Northrup’s book. After taking the Money Love Quiz to see where on the spectrum your relationship with money stands—somewhere between “on the outs” and “it’s true love!”—Northrup takes you on a rollicking ride to a better understanding of yourself and your money. Step-by-step exercises that address both the emotional and practical aspects of your financial life help you figure out your personal perceptions of money and wealth and how to change them for the better. You’ll learn about thought patterns that may be holding you back from earning what you’re worth or saving what you can. You’ll learn how to chart your current financial life and create a plan to get you to where you want to be—whether that’s earning enough to live in a penthouse in Manhattan or a cabin in the Rockies. Using client stories and her own saga of moving from $20,000 of debt to complete financial freedom by the age of 28, Northrup acts as a guide in your quest for personal financial freedom. She’ll teach you how to shift your beliefs about money, create a budget, spend in line with your values, get out of debt, and so much more. In short, she’ll teach you to love your money, so you can love your life.